Since there has been a flurry of business reference activity around small private businesses on the one end of the spectrum and foreign businesses on the other, I decided it was time to take a look at additional company information databases. My curiosity about the level of detail included in the Dun & Bradstreet reports available through Mergent Online got the best of me. With our trial to that module activated through the end of the month, my curiosity is satisfied. Give it a work out and let me know what you think. 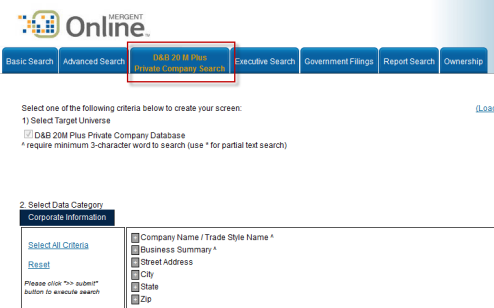 Other databases that have private company information include ReferenceUSA (search the U.S. Businesses/Employers module) and Lexis-Nexis Academic (Use the Company tab on the left and Dossier Create a Company List). Foreign private company databases we subscribe to include the aforementioned Lexis-Nexis Academic, Datamonitor & ISI Emerging Markets and Uniworld.